Undoubtedly, this was one oil I was least excited to receive if for no other reason than the fact I have never liked anything scented with Lavender. What I’ve come to learn is this, natural essences are much more pleasant than man-made versions. After adding Lavender Oil into my daily experience for the past week I have had very few earth-shattering moments with it. Perhaps, it has helped me sleep a little better which makes me happy but it’s hard to say whether or not Lavender was the cause. When put to use on my temples during a headache, it seemed to dull the throbbing which was a welcome surprise. I even attempted the use of Lavender in my diffuser necklace but found it to be too strong for my sensitive sniffer. A little Sweet Orange Oil added to the mix made it much more bearable for me to wear. It was great catching a whiff of the lovely scent during the middle of a busy day, it left me feeling more clear headed than normal. *It has been touted that Lavender may help ease conditions such as anxiety, arthritis, asthma, headaches, heart irregularities, high blood pressure, bug bites and bee stings, skin conditions, sunburns, ear aches, gallstones, depression and much more. The uses seem endless with this universal oil – if in doubt, use Lavender! As an aromatic, Lavender has long been used to promote a general sense of well-being and to relieve tension. It blends well with most oils including anything citrus based (Sweet Orange in my case). Lavender is a great oil to start off with because of its many uses. Below I have included a couple ideas for you to incorporate into your own home. Combine the ingredients and apply to clean, dry hair. Cover head with shower cap and wear for several hours. The mixture helps suffocate the adult parasites. Nits will not be affected so the treatment must be repeated a week later. This is a great option to try if you are wanting to avoid harsh chemicals in the treatment of lice. To create a lice repellent you can add drops of Lavender to your regular shampoo or use a Lavender mist in the hair daily. Just combine in a spray bottle, shake and apply! Now for a great everyday use for your Lavender Essential Oil! I’m excited to try this one once I have some empty deodorant containers! Combine the Coconut Oil and Bees Wax on low heat just until melted. Remove from heat and add the Cornstarch and Baking Soda, mix. Add your essential oils and pour the final product into an empty, stick style, deodorant container. Allow to cool and use as you would a normal deodorant. This will NOT keep you from sweating as it is not an antiperspirant! 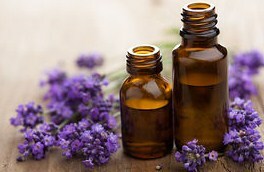 In a similar recipe I found online, the essential oils used in a semi-liquid form of deodorant were Lavender and Rose. I’m sure Lavender and citrus would go just as well together but it depends on which scents suit you best. One point to make – be sure to include a naturally antimicrobial oil. These oils can give you a power-packed punch keeping those pesky odor creating bacteria at bay. You may have to tweak your essential oil amounts to find a balanced mix to please not only your senses but also your skin. Some examples of strong antibacterial oils are Lavender, Tea Tree, Geranium & Lemon. Oregano is also a powerful antimicrobial oil but it may be too powerful for everyday use on the sensitive underarm area. As always, do your research when trying an essential oil for the first time. Read the bottle for intended usage and start with something simple like diffusing so you can better gauge the strength and aroma of the product you are using. If you are interested in dipping your toes into the oily waters, just shoot me a message and I can help you get started! Happy Oiling!